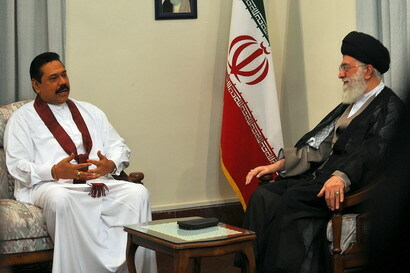 President Mahinda Rajapaksa who is currently in Teheran to participate in the G15 Conference has met Islamic Supreme Leader of Iran Grand Ayatollah Seyyed Ali Hoseyni Khumenei last evening at the Revolutionary Leader’s residence. 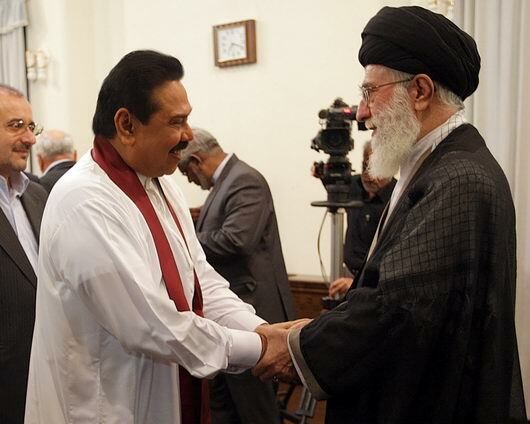 The Iranian Supreme leader wished the Sri Lankan President for his achievements and requested to carry forward continuously the speedy development process now taking place in Sri Lanka. President Rajapaksa arrived in Teheran on Sunday to attend the Summit which is scheduled to begin at the International Islamic Conference Hall in the Iranian Capital on Monday 17th May. Minister of External Affairs Prof G.L.Peiris, Secretary to the President Lalith Weeratunga, Secretary of the Ministry of External Affairs Romesh Jayasinghe, MP Sajin Vas Gunawardena and Sri Lanka’s Ambassador to Iran M.M.Zuhair were present.